EU Armageddon Postponed Until Further Notice?. European bonds had a good day today. A good day is when nothing blows up. After a brief spurt higher, which sent S&P futures down a percent last evening, Italian bonds settled flat as did German bonds. 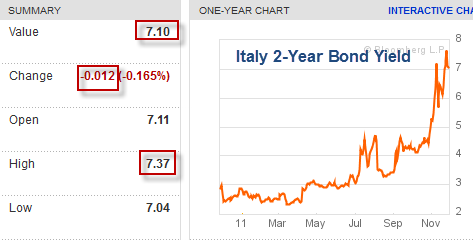 In spite of the fact that Italian debt yields are above 7%, this was a “good” day. Steen Jakobsen, chief economist from Saxo Bank in Copenhagen notes a huge belief in fairy tales. Steen writes via email …. There is HUGE believe in the ECOFIN meeting producing news, good news on the fiscal union. Some commentator speculate we will be in EU Heaven. Clearly these things takes a lot longer time wise than we would like but declaring the EU either dead-or-alive by the next EU Summit on December 9th is slightly overdone. The EU process continues and the politicians clearly feel they have ample time on their hands. 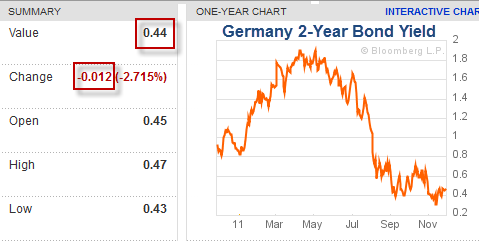 EU monetary history is full of delays and Germany giving in to pressure. Merkel’s position is under pressure and the Bund Yield has become our barometer for pro-EU solutions – for now the trend is clear – we are on-route to Germany giving up and soon. Still short since last FOMC – market still oversold – could be 1210/1220 on month-end manipulation, but overall low volumes and stress-indicators continuing higher creates two-way risk. 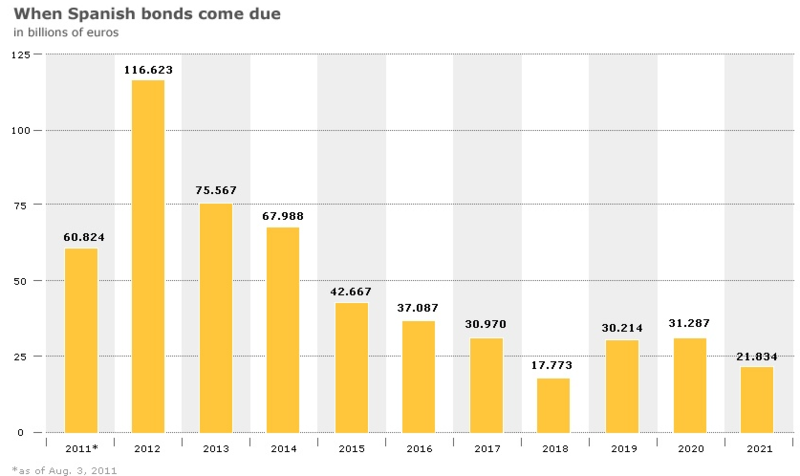 Here are bond schedule charts from Bloomberg that highlight the difficulty for Italy and Spain for the next few years. Yesterday, we were struck by the increasing convergence of the views of various market observers as to the outcome of the ongoing crisis. It seems now widely accepted as almost a fait accompli that the euro will disintegrate within weeks. 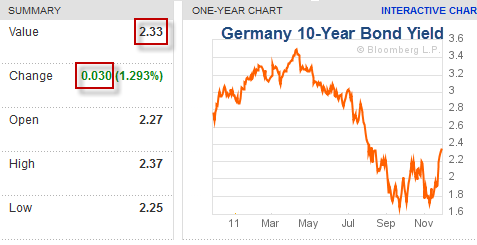 Even Jim Cramer (euro bears please take note…) is now on ‘Defcon 3‘, predicting imminent ‘financial collapse’. The Economist writes ‘Unless Germany and the ECB act quickly, the single currency’s collapse is looming‘. We certainly agree that Mrs. Merkel is possibly underestimating the speed and ferocity at which a market panic could crush her ambitious integration plans. We also agree that there are a number of potential events that could become the triggers for such a panic. There is considerable risk that in the case of the failure of a big bank, a wave of cascading cross-defaults could engulf the system. 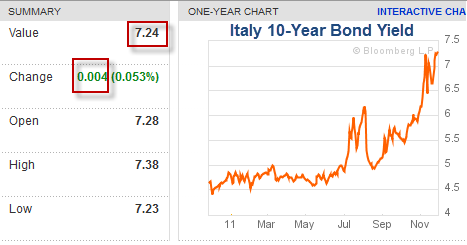 As noted before, Italy and Spain are unlikely to be able to refinance their debts in the markets for very long with bond yields at 7% or higher. To be more precise, they may well be able to roll over their debt at such yields, but sooner or later market access would close down due to the arithmetic of the debt spiral these high yields would inexorably produce. Meanwhile, speculators have certainly joined the bandwagon, increasing their net short position in euro futures to yet another 17 month high, with their exposure rising another 11% last week alone. 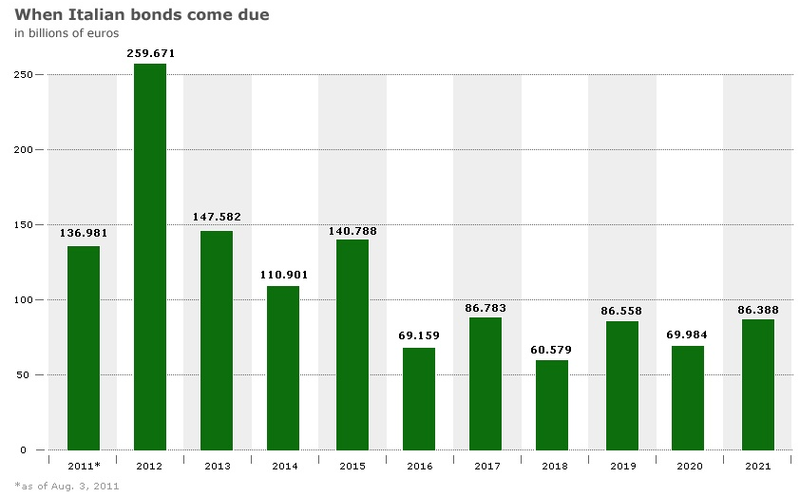 However, if you thought it cannot get any more apocalyptic than that, Zerohedge reports that Moody’s is now reviewing the ratings of 87 banks in 15 countries with a view toward downgrading their subordinated debt. When it rains, it pours. Considering all these panicked invocations of imminent collapse one is left to wonder though, why did the DJIA rise by nearly 300 points yesterday? If we are not completely mistaken about the meaning of positioning data, then we would argue that with virtually everyone already sitting on the same side of the boat, the markets will begin to do the unexpected – which in this case means the euro should at least see some short term strength, which in turn would have affect many other markets due to the well-known and well-worn inter-market correlations that the systematic black boxes and robots trade off. The boat was too one-sided for now. However, a relief rally and a global recovery are two different things. The euro-boat is filling up with water and will eventually sink, only the timing of when and how is unknown.